Photo: Jeff Vespa / Getty Images. In our books, the big winner of the 2013/2014 awards-show season was Jared Leto's hair. From man buns to hombré (that would be "he ombré"), the man was giving us some SERIOUS mane envy this season. Who didn't want Leto's hair for themselves? We may or may not have even taken a photo of him into our stylist in an effort to score that perfect "I woke up like this" wave. Tonight's Oscars ceremony was the coup de grâce for his coiff, which ended its red-carpet run with a super-sleek finish and just a touch of bounce on his ends. Oh, and an Oscar. NBD. The man behind those lustrous locks is Chase Kusero, Leto's long-time stylist who worked with Vidal Sassoon Pro Series to create his Oscar-winning look tonight. We've spent so many weeks obsessing over Leto's hair that we figured — for our own mental well-being, that is — we needed to go straight to the source. We spoke with Kusero to get the scoop on everything from the conditioner that keeps those strands shiny and soft to why Leto is so over his Jordan Catalano (hair) days. Keep clicking to find out just why Leto's hair is so much better than, well, everything else ever. Jared's Oscar look was so shiny — how'd you get that gleam? "Jared and I don't usually think about what we're going to do — it's kind of a feeling. The day of, we see what's going on with what he's thinking about wearing and we take it from there. I used a couple of products last night. He did the Independent Spirit Awards, which are a much more casual event. So, I put a little product — the Creme Pomade and the Heat Protect & Shine Spray — and we let that sit in. Then today we bent a couple of pieces with a flat iron. [I don't do the flat iron] every time, but I just wanted to separate the hair more — we wanted it to be something more natural. He's got incredible hair, but I wanted it to not look too done. We wanted it to be the most true sense of Jared Leto." In your interview with Into the Gloss earlier this week, you mentioned it wasn't your intention to have Jared end up on best hair lists. Why not? "That's the thing: They misworded it by saying my biggest challenge was not to make him look like a woman. We never go into cutting or coloring his hair with that thought in mind. In Hollywood, they want to be known for something — Jared didn't want to make this stretch of success about his hair. We did decide to grow his hair a few years ago, but it was never his intention to end up on a list with female actresses. It's inevitable. We just do what we do and he has amazing hair to begin with, so we just let it be." Has Jared said anything about how he feels being on those lists? What do you think he'd say to the fact that we've seriously considered bringing his photo into our hairstylists to replicate his hair? "He definitely is not that guy. He is an artist in the truest sense of the word. He understands that it's something that will be talked about. His hair does look great." What is the secret to the perfect man bun? "That was another challenge — putting a guy's hair up. You don't want it to look like it's been put up. The secret behind that is I sort of had him tie it back himself. Before I pulled it back through the elastic, we left that part underneath and I let the band snap and it tucked it, and it was a really natural reaction. We could have gotten rid of all that hair, but we left it and was like we'll see and it worked. For me, as a hairdresser, it's been great to recreate the idea of you doing your own hair. That's what we've been doing with him. Sometimes we try to make it look less done. He's a guy in the truest sense of the word who [just happens to have] great long hair." The past few years, men's hair has been dominated by the Don Draper groomed look. 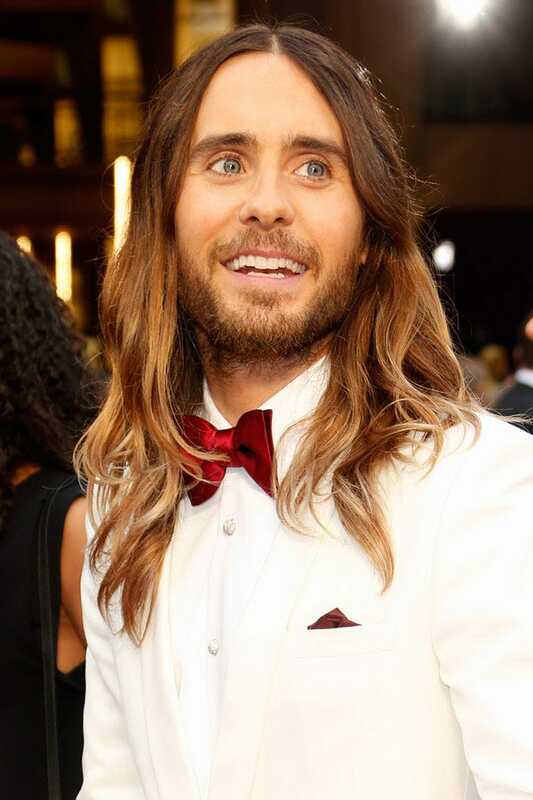 Do you think all the fuss over Jared's hair is going to lead to a resurgence in long hair on the red carpet? "Jared hasn't been in the spotlight for a long time, so it's not like he grew it for a movie. He's just kind of Jared, and he happens to have long hair as he accepts this award. Hollywood is too based on character: Unless an actor is growing their hair out for a character or movie, you won't see it [as a trend]. I do think you are going to see guys wanting to be trendy going long. I'm already getting calls from random guys wanting ombré." Ah, yes, the ombré. What's the secret to his perfect hombré? "We did his color when it went from that awkward length and finally dropped into good long hair. It was a little dark and I painted some pieces through it and that was it. We colored his hair once or twice to make it look more separated. We don't touch it up — with his look you don't need to touch up. It was just playing with it and it worked." Many people (okay, fine, just us) have said Leto is out-Olsening the Olsen twins in the beachy-texture department. Who do you think wins in a hair battle? Leto or an Olsen? "Jared Leto. I'm sure their hairdresser says the same thing: It's a challenge to get that undone-but-done texture, but for me, on a guy, it's more challenging. If I'm on the red carpet, I want it to be done but I want it to look like my hair. I think the Olsen twins had a great run, but it's Jared Leto's moment." His hair always looks so soft and shiny even with that undone texture. What conditioner does he use? "We use the Colorfinity Conditioner [for his ombré] and the Waves Texturizing Conditioner. This goes for everyone — if there's a little bit of wave, the hair can tend to be on the drier side, so you want something that is going to enhance the texture but also provide that moisture." 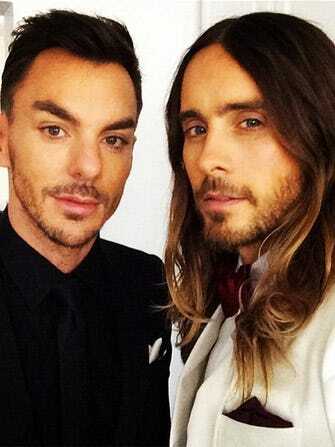 Which Jared hair phase do you prefer: the Jordan Catalano days or modern-day Leto? "I think that Jared has really been over the Jordan Catalano phase; he's embedded that into my head, so right now is my favorite phase. We've done a lot with his hair — we gave him a mullet a couple years ago, but this is a new-generation iconic rock star. It's also a new-generation iconic movie star, and in this case, you've got them both."